We succeed developed the Nanofibers production machine that high-performance sound absorption and heat insulation (product name "SELAB Nano ®"). We are manufacturing and sales the Machine to the Nanotechnology market. Developed Nanofiber mass production machine!! Nano-fiber has been studied as a “dream new material” from various industries. Traditional nanofiber production technology has production safety problems and difficulties for mass production, leading to very high production cost as a result. Our original technology realized mass production with a machine that everyone can handle. We believe that our newly developed mass production machine can be utilizes for various fields. How nano-fiber changes our daily lives? Makes our living and office space more comfortable / Makes heat insulation material thinner and more functional, enabling application to narrow spaces that previously difficult to work at / Makes sound absorption material thinner and more functional, enabling application to narrow spaces that previously difficult to work at / Enables less noise and more comfortable trip by cars, trains, and airplanes / Makes more functional filters that block pollen, PM2.5, and influenza viruses / Brings further cleanness and comfortability by adding deodorant and antibacterial functions through TiO2 coating. Polysaccharide nanofiber enables biodegradable gauze for medical operations that human body absorbs and that doctors do not need to collect. Biodegradable gauze reduces both medical risks and operation times. Moisturizing nanofiber creates drastically high-functional beauty care products. 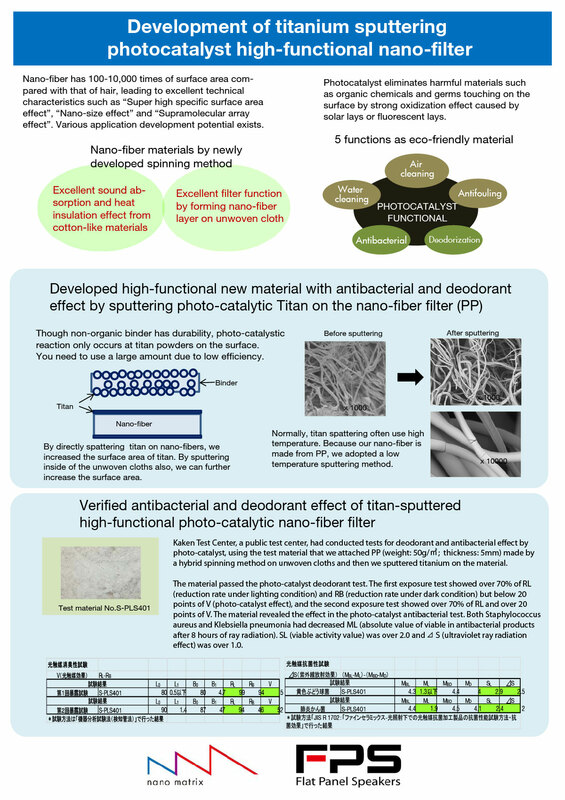 Moreover, low-cost nanofiber creates new products in business areas that people previously did not consider to use nano-fiber, such as the case for agricultural materials. How nanofiber changes environment of the earth? High-functional heat insulation material reduces fuels, CO2 emissions, and air conditioning cost as a result. High-functional filter blocks emission of air pollution materials such as PM2.5. Moreover, material from recyclable material (PP) enables 100% recycling, contributing to environmental protection from waste disposal aspect. Safe nanofiber mass production technology that we developed innovates your life and business and saves the earth. We strive for contributing to further development of humanity through alliances with various people using our technology. We strive for further technical innovations through nanofiber technologies.